Usually harvests in late June/early July and stores into mid-winter at room temp. Grows great in the northernmost locales but the further south you get the more difficult they are to grow and forget about growing them in the south. Russian Red is a Rocambole garlic with a rich, musky, garlicky flavor and is very hot when eaten raw. Rocambole garlics have brownish-purplish bulb wrappers and easy to peel brownish clove covers and so does Killarney Red. 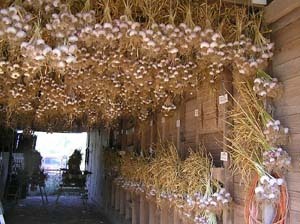 Rocamboles are valued for being early harvesting full flavored garlics that you can enjoy while waiting for the longer storing ones to mature and harvest. Russian Red's cloves are all of similar large size with no small cloves.